There are three main states of consciousness that you reliably cycle through every 24 hours: waking state, dreamless sleep and dream state. Each of those states is characterized by a distinctive electrical brain activity. But long before scientists were able to record and analyze our brain waves, yogis knew that these states were very different from one another. They postulated that all states of consciousness are reflected in the symbol and sound of OM. 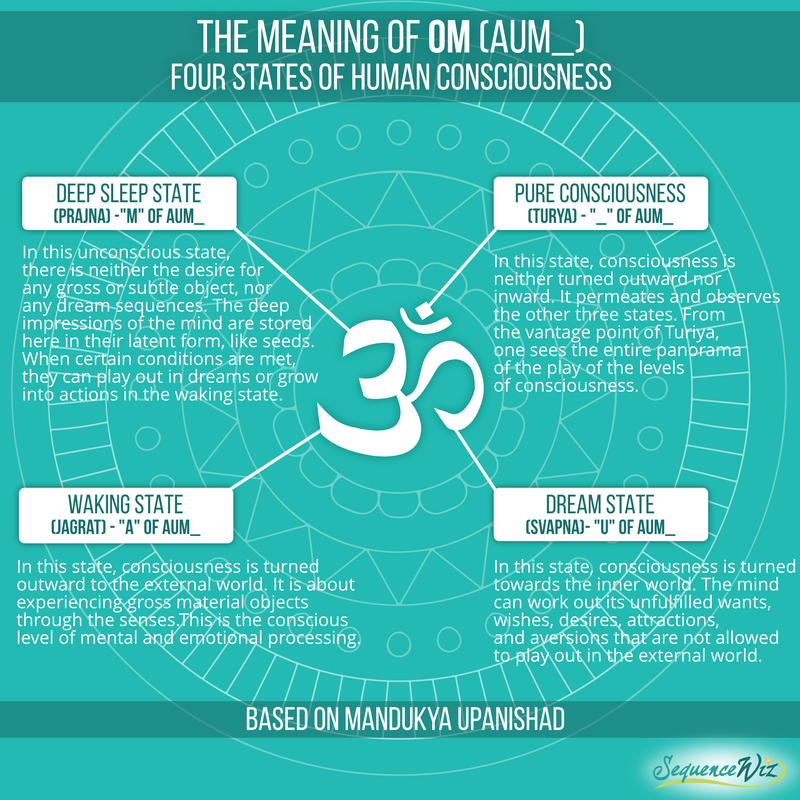 And technically, the sound that we know as OM is actually AUM_; it consists of three letters and silence at the end. The entire Mandukya Upanishad is dedicated to the meaning of OM and how it represents the states of human consciousness. Here is what it says (translated and interpreted by Swami Jnaneshvara (1). Waking state – Fast frequency chaotic brain waves due to processing huge amounts of sensory information. Dreamless sleep (NREM) – Slow-wave sleep that is synchronous and predictable and sweeps from the front to back of the brain, encouraging collaboration between distant regions of the brain. Dream sleep (REM) – fast and desynchronized brain waves processing the inner content of the mind – emotions, motivations, memories. This fourth state is usually called “pure consciousness” or “superconsciousness”. It sounds remarkably similar to the meditative states with distinctive brainwave activity that the scientists had observed in long-term meditation practitioners. We will talk about this groundbreaking study that was conducted in 2004 next time and discuss how it relates to the forth state of consciousness. Tune in! Previous story What happens in your brain when you sleep? Next story How can we get to the state of pure consciousness?